Other herbs like tarragon or basil make a terrific salsa verde as well. 1) In a medium bowl, combine the olive oil with the chives, parsely, mint, lemon zest, lemon juice and garlic and season with garlic scape season salt. Let the salsa verde stand at room temperature for 15 minutes to 1 hour. 2) Meanwhile, in a large saucepan, cover the potatoes with cold water, add a large pinch of salt and bring to a boil. Cook the potatoes over moderately high heat until tender, about 8 minutes; drain and return them to the saucepan. Add 1 tablespoon of butter and toss to coat. Season with salt. 3) Bring a large pot of salted water to a boil. Add the garlic scapes and cook until tender, 3 minutes; drain. Return the garlic scapes to the pot and stir in the remaining 1 tablespoon of butter. Season with salt. 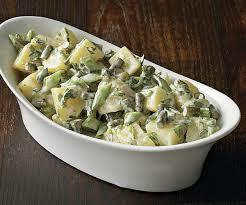 4) Add half of the salsa verde to the potatoes and half to the garlic scapes, stirring to coat. Transfer the garlic scapes to a serving bowl. 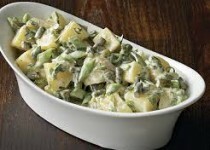 Top with the potatoes, garnish with the chive blossoms and serve right away.